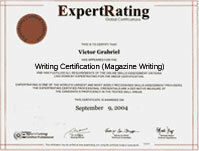 (leading to ExpertRating Writing Certification-Magazine Writing). Have you ever thought about writing for magazines? Turn your dreams into bylines and help yourself to a bright future as a magazine writer. It's fun, it's easy, and a great source of extra income. If you're a determined new writer, or if you haven't written for magazines in years, this class will jump start your career. You'll learn plenty of powerful brainstorming techniques designed to practically write every article for you. This course includes a knowledgeable and caring instructor who will guide you through your lessons, facilitate discussions, and answer your questions. The instructor for this course will be Eva Shaw. About the ExpertRating Online Writing Course (Magazine Writing) instructor:Eva Shaw, Ph.D. is a full-time working writer of 1000 articles, essays and short stories. She’s the ghost or author of 70 books including: Ghostwriting for Fun & Profit, Writeriffic: Creativity Training for Writers, Write Your Book in 20 Minutes (a DVD), Shovel It: Nature’s Health Plan, What to Do When a Loved One Dies, The Successful Writer’s Guide to Publishing Magazine Articles, Writing the Nonfiction Book, Insider’s Guide to San Diego, The Sun Never Sets, and more. Eva's work has been featured in USA Today, San Diego Union Tribune, Shape, Woman’s World, Country Living, Costco Connection, Publisher’s Weekly, Washington Post, the Wall Street Journal and others. She has won several awards, including the Book of the Year Award from the American Journal of Nursing, the Benjamin Franklin Award, and the Woman of Merit Award. An expert on time management for writers, Eva stays on top of market trends to sell her own work and to help emerging writers focus on quality writing and publication. Online Magazine Writing Certification requirements: For taking this instructor led ExpertRating Online Writing Course (Magazine Writing) you need Internet access, E-mail, and the Microsoft Internet Explorer or Mozilla Firefox Web browser. "As you suggested, I got the courage to call our local newspaper today and talked to the editor. I had previously had sent her a short resume and some clips that had been published in the newspaper. When I called her today and suggested 2 different articles, she told me to write them up. She wants 3 articles. One on sugar-free desserts and the restaurants that do and do not serve them. Then she said she wanted me to do some articles on then and now. She asked me if I wanted to do it weekly or monthly. I said monthly. I asked her the word length and she told me to take pictures to go with the articles. I was so excited I forgot to ask her how much they pay. She was so excited and so was I. I am writing down the ideas for the then and now articles. I am still looking for the places to send a query letter from my article list. And we're just in Lesson 4!" "Before I jot down some goals I want to say how perfect this class was for me. I submitted my finished article last week and the editor was thrilled with how organized and creative it was. Not tooting my horn but yours, Eva. Having taken this course and Writeriffic (last year) I used your advice to help me through this (my second) assigned article. The bubble method and interviewing tips were especially helpful. I immediately queried the editor after I submitted the article and she accepted so I'm now working on my second paid assignment. THANK YOU. I hope this is my start." "Can you get addicted to something like this?! I keep telling myself I'm finished with the course, but I can't seem to stay out of the discussion area. It's like when I was a little kid and hated to go to bed at night, because I was afraid I'd miss something. What am I going to do without you all?! I'm having serious withdrawal symptoms!" "Dear Eva, I am so grateful for your support and instruction. I must admit I was not too sure about the whole on line course process, but you far exceeded my expectations. Although I have not posted all of my work, I have learned so much and have gained some confidence. Thank you." "Dear Eva, Thank you for a very informative class. I learned too much to note. I also learned my writing weaknesses such as time management, fear, and a loss of creativity from being rusty. Your biggest help to me was answering all of my technical questions pertaining to format and content of articles. Now I can look like a professional when I submit my work! I also deeply appreciate your encouragement and motivation in submitting my queries and in writing in general. I never lost my desire to write but I was at a place where I felt it was a dream that had to be postponed for another 5-10 years. Now I am truly excited again and I know even if I do a few "bubbles" a day, I can get there." "Dr. Shaw is a dedicated and enthusiastic instructor. The amount of time she spent interacting with the class in the Discussion area exceeded my expectations from other online courses I have taken. I would recommend her course without reservation." "Dr. Shaw is a wonderful instructor. From the start of the course she made a comfortable environment which encouraged students to submit their assignments and participate in the discussion areas. I will definitely be taking another one of her classes." "Dr. Shaw, you are tremendous. The only thing better would be to have some one-on-one critique of an actual writing assignment." "Eva absolutely knows how to bring all the players together as a team. Loved this class!" ExpertRating is one of the world's only ISO 9001:2015 Certified companies (from TUV America) offering an Online Writing (Magazine Writing) Course (leading to ExpertRating Writing (Magazine Writing) Skills Certification). When you choose the ExpertRating Online Writing Course (Magazine Writing) you can be sure that you are buying a premium International certification that is recognized by hundreds of employers and Government bodies in the US and other countries. With ExpertRating you get certified quickly online and you are equipped with a store house of information through the in-depth ExpertRating Online Writing Course (Magazine Writing) Courseware which has been developed by experienced Writing and Publishing Industry Experts. The ExpertRating Magazine Writing Certification is by far the best value for money instructor led Magazine Writing Program at $129.99. How much does the Magazine Writing Certification cost and what does it include? You can buy this ExpertRating Online Writing Course (Magazine Writing) leading to Magazine Writing certification at a special offer price of only $129.99 which includes the in-depth ExpertRating Online Writing Course (Magazine Writing) Courseware and exam fee. This is the best value for money Magazine Writing Program available till date. You get the following services within the USD $129.99 fee. 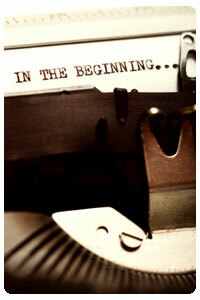 In-depth ExpertRating Online Writing Course (Magazine Writing) Courseware including scenarios and case studies. World wide airmail delivery of the hard copy Magazine Writing Certificate. The Magazine Writing Certificate can be used to prove your certified status and does not mention the words "online". The process of getting yourself certified is very simple. 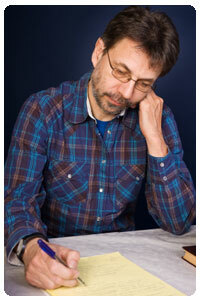 All you have to do is buy the ExpertRating Online Writing Course (Magazine Writing) for $129.99. Log in to the instructor led course using your password. Go through the ExpertRating Online Writing Course (Magazine Writing) Courseware (which would take you 6 weeks) and complete the final Magazine Writing Certification exam at your convenience. You can complete the exam within 2 months of buying the Magazine Writing Certification. The result of the exam appears as soon as it is completed, and your Magazine Writing Certificate is mailed immediately. Chapter assignments to help you practically use the Magazine Writing that you will learn during the Magazine Writing Course. The final exam is fully based upon the ExpertRating Online Writing Course (Magazine Writing) Courseware that is provided along with the Magazine Writing Certification. If you have gone through the courseware properly you should not have a problem clearing the exam. The exam consists of multiple choice questions from all chapters of the ExpertRating Online Writing Course (Magazine Writing) Courseware. If you want to be a writer of magazine articles, be a reader and take tips from this valuable course. A lot of writers want to write for magazines, but it can also be a tough industry to break into. First, there is a specific writing format that the magazines follow and second, it's important to know the readers for whom you are writing for. Read as many magazines as you can and when possible, request sample issues. Pay attention to the kinds of articles the magazines run. If you are interested in writing organic health articles, submitting your ideas to the magazine that features recipes that call for canned soup and processed cheese might not make a lot of sense. Magazines are not going to change their basic format just because a fantastic freelancer like you has queried them. The ExpertRating The Craft of Magazine Writing Certification course will help you to tailor your writing to the needs and style of the magazine. Did you know that you don't have to be an expert on a topic to write a magazine article about it? And you don't need a wall of diplomas to be a writer, either. If you think it's necessary to have taken formal courses in writing, journalism, or communications to write, reconsider that idea. In this lesson, you'll discover where ideas originate and get started as a writer of nonfiction magazine articles. Ask a magazine writer about the genres available to this profession and you'll learn about consumer topics, informational pieces, question-and-answer formats, true crime articles, and a bunch more. You'll hear about how-to articles, too. If you've been seriously thinking about writing for magazines—which I hope you have—you need to know about the categories. You'll begin that investigation in this lesson. You've just purchased the latest market guidebook with the writing guidelines for oodles of magazines. It's awesome, complex, and exciting. If you feel overwhelmed, you're not alone. Some new writers get copies of market guidebooks and, once they've thumbed through them, put them aside. The books can be intimidating. But after this lesson, you'll be a pro at selecting magazines that want articles from you. By the end of it, you'll be able to use an innovative outlining tool, called The Bubble Method, which will help you make every single topic a potential article. What is a query letter? Do nonfiction article writers really need them? How can you write one that will capture the interest of editors? That's what this lesson will discuss—giving you a foundation for writing a query that sells your ideas. In this lesson, you'll get a quick review of production tips and grammar rules. But the gem is a section on how to interview the people, experts, and celebrities that you'll be writing about. Whatever type of article you write, you may have occasion to interview someone. Not being an effective interviewer will diminish your chances of success. However, what you learn in this lesson will make interviewing fun and easy. Money. It's the topic of this lesson, and will be discussed in depth. Then this lesson will debunk that bugaboo, writer's block. Yes, writer's block is out there, waiting to get your attention and stop you in your tracks. But in this lesson you're going to learn how to simply acknowledge it and then get writing once again. Do you know your reader? Most new writers say, "Hey, of course I do." Then they look at the person as if he’s from the planet Zod, and they seem to be saying, "What a silly question." But unless you know who you're writing for and write in a fashion that captures and sustains a reader's interest, you'll find writing for magazines a huge challenge. So, this lesson will talk about writing for a reader, ways to create clear and crisp writing, and writing fillers and essays. Have you ever wondered how magazine writers know how many words are right for a specific topic? Have you thought about where sidebars come from? Do you want to gain credibility for a nonfiction book and further your profession, cause, or company? You'll get answers to these questions and much more here, in this lesson. By the end of this lesson, you'll be able to research topics for articles and understand how to get yourself into the research picture. It's nearly painless and really fun once you know the techniques professional magazine writers use. Do you need to interview an expert or get a quote from one to make your article sparkle? You probably have a book in your house right now that would supply what you're looking for. This lesson will talk more about finding experts to make your articles sizzle. Then this lesson will examine the tools you need to self-edit. Self-editing is the polish that turns okay writing into publishable words. Recycle your research and you'll be able to sell and resell ideas without reinventing the wheel. That's the focus of this lesson. This lesson will also discuss writing about theme and seasonal articles, locating regional publications that would be crazy not to have you write for them, and networking with others to increase the number of articles you sell. You're about to print an article on which you've been working for a week. It's dynamite and headed for publication in a major magazine. This is your lucky break. As weird as it seems to a cyber-savvy writer like you, the editor wants a printed manuscript. After thinking, "This magazine is still in the dark ages," you smile and comply. However, you've run out of paper (or need a printer cartridge) or stamps or some other indispensable writing supply. If this hasn't happened to you yet, it may, unless you realize that time is money. Time management is the final topic of this lesson and since you only have so much time in your days, in this lesson you'll learn how to use what you have, and use it well.